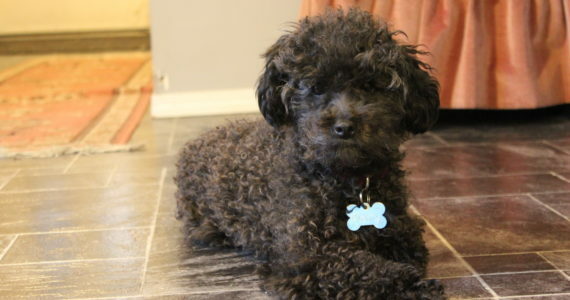 When we were given the opportunity to adopt a little black poodle I just couldn’t pass up the chance. 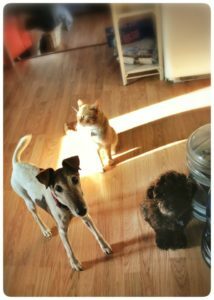 Of course this means we are now pet rich and I too think this is more then enough now, but it also means we are blessed with a variety of very different pet personalities in the house and they all suit our family differently and excellently. A little over a year old now, Persephone gets called Percy for short. She is very affectionate and sympathetic. As with our other two pets, it seems we got her at just the right time. A dog who cares when I am upset but is able to keep her cool and will seek to calm me down is just what I have needed this winter of mourning. At this point in my life having a puppy who, in contrast to my old timer pup, is calm enough to care for me is the perfect compliment to our family of furry friends. Years ago, when Riddick arrived I needed a pup who needed to be cared for and would pull me out of my funk in the middle of a collection of health issues. With all his anxiety issues he really wanted me to love him and needed my attention. 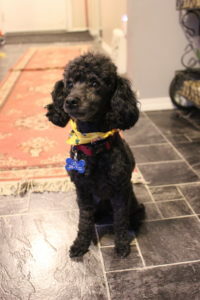 He was a quiet dog and easy to fuss over with an easy coat and a show dog heart that adores to be cleaned and primped. He got me out daily for exercise and I really took pride in teaching him he could trust and rely on me. However, he is not people focused and usually is just plain confused when I am not in great shape emotionally or physically… thus why I think Persephone came along. She takes over where my stressed old boy can’t. She will look me in the eyes and check on me, follow and cuddle me, demand to be held when I guaranteed need a hug. All the animals, cat included, have been very cuddly with me while I weep and struggle to make it though each day. I have spent many an afternoon with them by my side while I nap or just sit in silence for hours… silence is often how I deal with emotional pain and these fuzzy little friends seem to get it so well. I don’t believe in luck but I do know when to count my blessings. Each one of my pets has been a blessing to adopt and love. 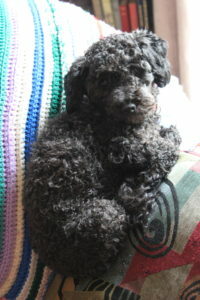 and Persephone, the mini black poodle!